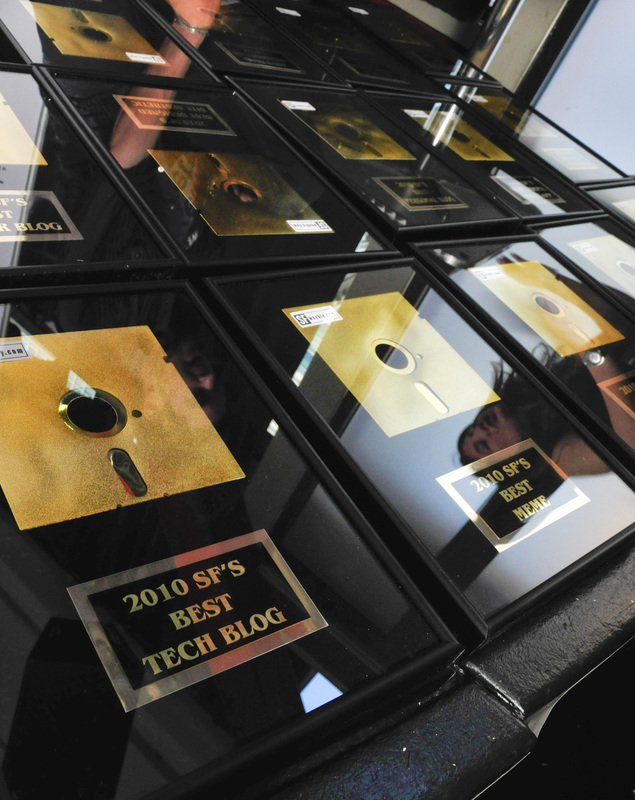 This was SF Weekly’s first year to host a Web Awards and it turned out to be a very successful event. Our Web Editor spearheaded the poll which had a total of 35 award categories for the public to vote on, and I proceeded to put the marketing campaign and awards party together. Once the poll was closed and the winners were chosen, the awards had to be ordered. With an idea in mind from the LA Weekly’s Web Awards, I went with these really fun and unique framed gold-plated floppy disks. They came out great! For the location of this event, I went with this really popular art gallery/club called 111 Minna. We filled that place to capacity! The set up was great with Vitamin Water providing the step-and-repeat for the photo booth that was created using furniture from our sponsor White Furniture. The bar was hosted by Devotion Vodka, Distillery 209 Gin and Asahi Beer. There were some snacks but they went fast! Luckily, Kung Fu Tacos was outside serving up some of their delicious grub.